DNA is one of the most familiar terms to most of the people because this term is used in sci-fi movies, comics, and genetic tests. DNA is a very famous term whose few things are known to common man along with many misconceptions. DNA stands for deoxyribonucleic acid, which is a molecule that contains the code of an entire organism. DNA defines the purpose, structure, development, and function of an organism. DNA is found in every cell of an organism and is copied from parent cells to child cells. You can consider the DNA similar to a program of a computer and the body of a cell as hardware on which program is executed. The cell constantly gets instructions from DNA to perform various function throughout its life. 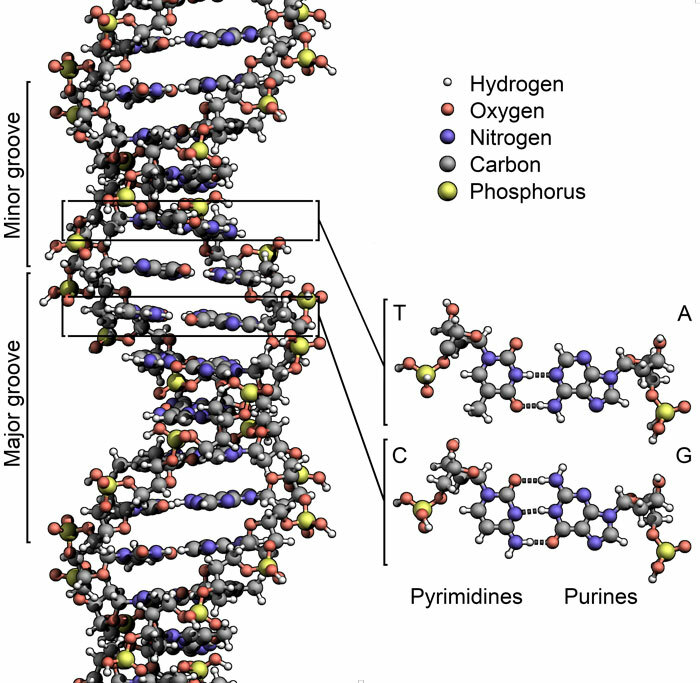 DNA is a very long molecule which is very thin and has a double helix ladder shape. The structure of DNA can be divided into two parts; the backbone and the bases. Backbones are the twisted pair structures which are located at sides of the double helix shape and are responsible for holding the bases of DNA together. Bases are the actual fundamental blocks which form the DNA code. Bases are represented by four letters; A, T, C, and G. These four letters are actually the representation of the nucleotides which are adenine, thymine, cytosine, and guanine. These nucleotides are connected between backbones in such a way that only two particular nucleotides can connect together to form a pair; Nucleotide A will only connect to T, and C will only connect G.
The molecule of DNA is so long that it can’t be fit into a cell without a packaging. To pack large molecules of DNA in a cell, there are structures in cells which are called chromosomes. These chromosomes are the tightly packed and coiled molecules of DNA; one chromosome accounts for the single DNA molecule. In the cells of the human body, there are 23 pairs of chromosomes which are located in the nucleus of each cell. There are sets of instructions in each string of DNA which are called genes. You can consider the genes as the language which cells can understand. The genes instruct the cells about making specific proteins. These proteins are responsible for the functionality, survival, and growth of a cell. There are 3 billion bases in human DNA and 99.9% of these bases are identical in every people on the Earth. It is only 0.1% of these bases that makes every human being different from others. James Watson and Francis Crick in 1953 became the first to discover the double helix ladder-shaped of DNA. Friedrich Meischer in 1869 become the first person to isolate the DNA from a cell. Abdul Wahab, "DNA," in Science4Fun, April 14, 2019, http://science4fun.info/dna/.